Andrew Ahmat is currently completing an honours degree on gamma ray bursts under the tutelage of Associate Professor David Coward and Dr. Ron Burman. 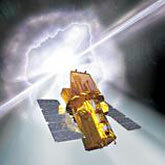 The Zadko telescope proved its worth almost immediately in late 2008 when it detected light from a massive gamma ray explosion 11 billion years ago – just a few billion years after the Big Bang. A team of UWA astrophysicists captured one hour of valuable video footage of the ancient light for the first time using the one-metre robotic Zadko telescope at the Gingin gravitational wave observatory, 70 km north of Perth. The telescope was the first on Earth to observe light from the explosion after it was initially detected and its coordinates relayed to ground stations by the US Swift satellite, launched in 2004 to monitor gamma ray bursts. The Zadko telescope recorded the explosion two hours after Swift detected it; more advanced optical telescopes in Chile were unable to observe the event until nine hours later. The UWA researchers’ announcement coincided with the International Year of Astronomy in 2009 and marked the discovery of one of the most distant explosions observed from Australia. These explosions are extremely bright flashes of gamma radiation, regarded as the most powerful in the universe since the Big Bang. Had it gone off in our galaxy, gamma radiation could have potentially affected life on our planet, and many scientists believe it has done so in Earth’s past. NASA satellites have been observing gamma ray bursts since the 1970s, recording them at a rate of about one a day. These satellites were looking for gamma rays emitted by Soviet nuclear tests but instead found flashes of gamma ray bursts arriving from different parts of the sky. The UWA researchers have developed a computer program, the Probability Event Horizon filter, which analyses NASA data to predict such events. Some of these flashes are associated with powerful supernovae, or collapsing stars – the explosions marking the death of massive stars and their rebirth as black holes.